It is interesting that heavy elements like uranium decay to lighter elements which themselves are radioactive and in turn decay to new lighter elements. This sequence can go on for some time until a stable product is formed. The sequence of decays defines a radioactive decay series. In the series, the various intermediate elements are present in definite amounts such that the decay rate of the parent element (or the production rate of the daughter element) is equal to the decay rate of the daughter element. The decay rates depend on the number of atoms present and the half life of the element (time required for half of the atoms to decay). Thus all the elements in a radioactive series are present in definite amounts depending on their half lives. This is explained in the slide below. The way the graph in the figure is explained is that at the beginning if we start with pure parent element then in one second it will produce a number of daughter nuclii. Since this number is very small, there are not many decay per second of the daughter element (activity of daughter is small). This means that more daughters are produced than are decaying and their numbers increase. As their nos. increase their decay rate increases also and after about 6 to 7 half-lives an equilibrium is reached when the production rate of daughter is equal to the decay rate of the daughter element. This is Secular equilibrium. 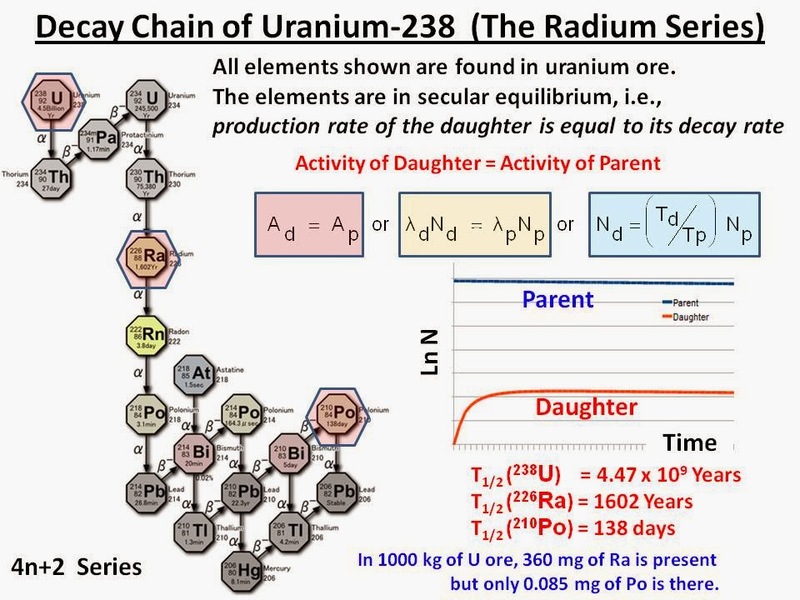 Since Uranium has been in the earth's crust for billions of years, there has been enough time for secular equilibrium to have been reached and all parent-daughter pairs in the radioactive series are found in the correct proportions.